We embrace the material. The natural, the structural, the use and design. Each individually, then together as one. We believe that utility and simplicity brings forth beautiful design. The furniture we create will fill specific roles within a home while showcasing the natural elements of the wood we diligently source for each piece. The journey will forever begin and end here. We had a special relationship with this project, in the shop, as it grew from two rough cut boards into what it is today. The unconditional freedom we were afforded in the design was rare. It was a mutual understanding that given an open state of mind, to create at will, true beauty would prevail. I am grateful to be a part of this table, to be a part of it’s structure, it’s core. Knowing it will be a place to rest weary feet or hold a cold drink on a hot summer’s eve. I am grateful for the influence this piece had on me, in my woodworking journey and to have it forever live with special friends. The table’s story begins on the surface. A book-matched cherry top with a beautiful depth of grain. Cracks and voids were filled with a dark epoxy to showcase the inconsistencies of the natural wood. The life edge was turned inward and held together with purple and yellow heart splines. The playful use of color reflects this couple’s artistic spirits and positive energy. The table base was created to flow with the mid century modern furniture in this lovely State College home. Nothing says, “welcome” like an inviting table at the entrance of a home. A warm spot where you can’t help but drop your keys, take off your coat and stay a while. It’s a place to house blankets, for nights spent watching the snow fall. It’s a place for a basket, filled with children’s toys. The table will forever remain a constant, always serving its purpose, perched so eloquently by the entrance of our home. Designed with a figured walnut top and modern maple legs. Similar to other projects, the cracks and voids were filled with epoxy to stabilize the wood and enhance the natural imperfections. The overall design concept was to bring out the natural walnut figure by housing it in a modern geometric frame, a design element we hope to carry throughout the Keird shop brand. The personification of design built for use. 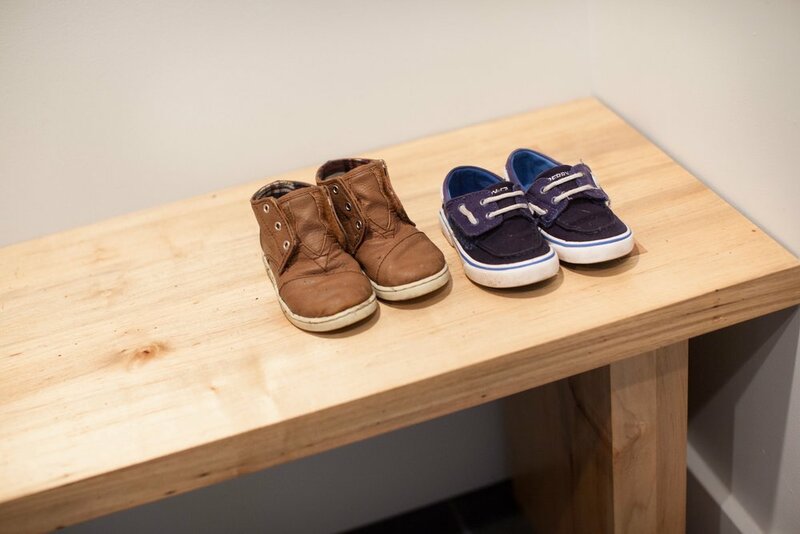 A place for excited children to put on their shoes before the outdoor adventures begin. A place for the groceries to rest before their journey to the kitchen. A place for dad to take off his work boots. A quiet corner, a shadow, a peace. A place that holds both the beginnings and endings of our days. 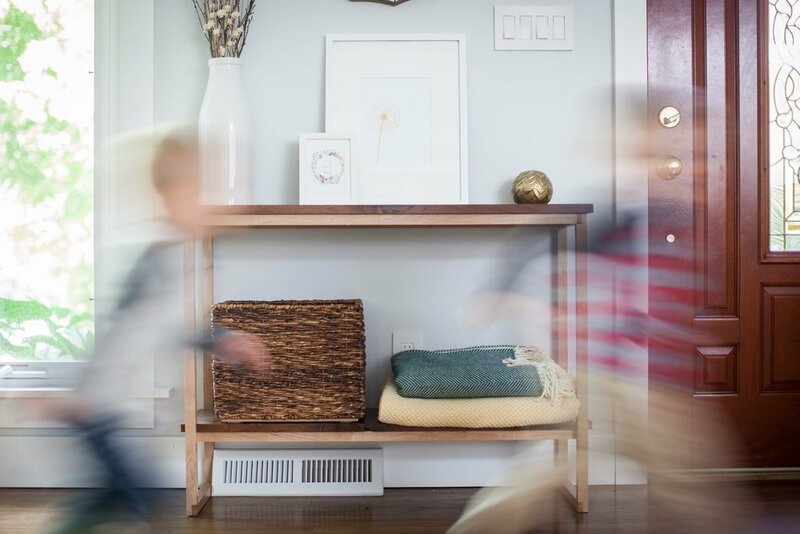 Constructed from maple, the massive legs ground the bench, rooting it firmly in the mudroom. Mortise and tenon joinery further the feeling of weight and provide structural stability. Beautiful natural figure wraps around the bench, glowing under the evening light. Finished with an oil varnish blend, the bench will wear slowly, over time, as it quietly watches the shoe sizes grow.